Like walking through molasses. I haven't been on the trail for very long, but I need to stop and take a break. I've come to the conclusion that this is going to be a long day if this is how it is starting out. My legs aren't weak and I didn't hike that long up Pole Canyon yesterday, more of a warm up hike, but I am struggling all ready. I'll chalk it up to low oxygen at this altitude and try to compensate with more fuel. I continue to hike down the connector trail from the main trailhead located some distance from the Wheeler campground. A lot of people just hike up from the campground but I like the connector trail and it is pretty horizontal and provides stunning views of Jeff Davis and Wheeler Peak. The morning sun is creating a reflective glow on the main sections of the peak, while casting the crags into deep shadow. Breathtaking. 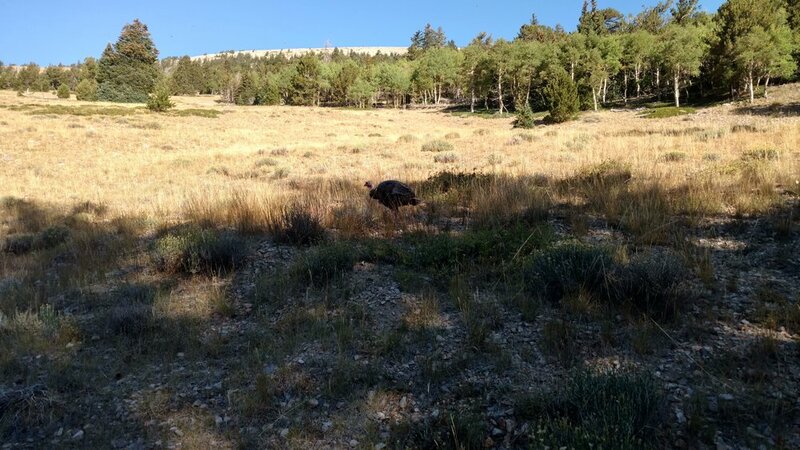 I stop again, this time to admire the large turkeys walking along the hillside. They are unafraid of me and slowly wander to a greater distance, I try to take a picture with one hand as I wander by, trying to keep the movement constant, turkeys however have a unique way of keeping their heads down and their back sides to you which makes it difficult to get a good picture. 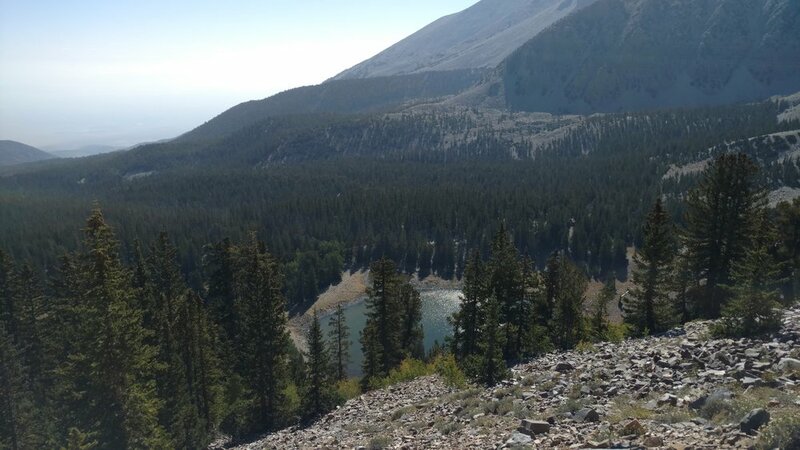 The trail connects with the main campground trail and soon splits again with one trail heading south toward the alpine pond and glacier and the other trail doubling back to the north and the summit of Wheeler Peak. I stop again. I haven't passed anyone, but several couples have passed me. One couple are obviously serious hikers or at least he is; decked out in hiker pants, boots, compression socks, poles and highland backpack. His companion isn't dressed as he is, but they are moving with motivation down the trail. An older gentleman had passed me earlier, but had now stopped at the trail junction. I assumed to rest as well and I mentioned that it's nice to have that one person to leap frog with. He smiled, started hiking and I never saw him again the whole trip. Breaking above tree line and onto the ridgeline, the trail crosses through a series of scrub pine trees before starting a grueling switch back trail up a stone path. The trees are soon gone and the incline is steep enough not to see the summit. I run into another couple that is moving just a little faster than I am, but they are stopping more frequently than the majority of climbers. We visit off and on at the different stops before they too keep moving when once again I need another break. I've tried every trick in the book to get my legs pumping, but it feels like they simply "boink" about every 15 - 20 steps and it takes a few minutes to revive them. At the high saddle, I take an extended break and eat lunch. The views have opened up to the east and west and I am sitting on a flat rock enjoying the sun. People come and go as they pass, but I'm simply enjoying the day. A slight breeze is blowing and it is nearly cool, but that's due mostly to sweat more than the temperature. I finally stand up and start uphill again. Crossing the first little bump, before the final summit push, my legs start to shake. I pause for a moment, then decide to end the hike. I'm not sure what is going on, but I've tried every trick I know and pushed it about as far as I dare too and still have enough energy to return. Reversing course I visit with a couple who had stopped to eat near the same spot I did. They were just finishing up, so I lingered to allow them to go first down the trail. Everyone, and I mean everyone is moving faster than I am. They soon paused further down the trail to visit with someone and I overhear them say they did not reach the summit either. I was surprised, but they simply said they were happy with their effort and proud of what they were able to accomplish today. I felt the same, but it was good to hear someone else say it too.